Pooja and Anshu are quite a sort of celebrities in their school. After all, their father is an ice-cream seller. At least, in a government school in a poor neighbourhood, this is something special. Other kids look at them in awe. They feel that the sibling are lucky as they can have ice-cream whenever they want though it may not be exactly the case. Kaushal Prashad came to City ten years ago and has made a living selling ice-creams six months a year. He pushes the handcart and first drops the children to the school and then goes ahead. He even picks them back in the afternoon, as the school is not too far. He has a small dwelling of his own now. In the government school where Pooja studies with her younger sister, kids don't flaunt cell phones or make fun of the kid whose family has a mere Maruti 800. Here cycles are a luxury. Most come on foot and not everybody has a full uniform. Families don't have enough money to buy separate dresses for everybody. And so Kaushal Prashad's wife got a piece of cloth for the kids' uniform. Her husband also got trousers of the same piece of cloth. Do you give them ice-cream whenever they ask? They don't ask too many times, he says. 'kabhi kabhi to dena hi padta hai'. Though the youngest kid, a son, who is at home and yet to get admission pesters him more. Kaushal Prashad earns 4,000-Rs 5,000 a month and is quite satisfied with the earning, hopeful that it will pick up in the scorching summer. Once the season passes, he will go to mandi and sell vegetables. I am not sure what plans he has for his kids' future. He wants them to study. Though his income may not rise as fast, as the fees for educational institutes and competition examination forms is going up, he is not bothered. He knows that they will make up their mark somewhere. He hasn't done too badly, in fact, better than his brother who went to Mumbai and is hardly able to spend time with his children. And Kaushal Prashad's children are proud of their Pop. His job brings them joy. Other kids ask them 'tumhare papa ice-cream bechte hain'. And the kids get a feeling that they are lucky. That's childhood innocence. This post is part of the series of stories, 'How the ordinary Indians live. Almost every day there is a grand 'mushaira' somewhere in the country apart from numerous small ones in the towns, however, Delhi being the capital plays host to a number of important mushairas. The major mushairas in the national capital recently were organised by Urdu Academy, Anjuman Farogh Urdu and Aalami Urdu Trust-Ghalib Institute. It is still not rare to hear couplets that stay with your for sometime and can lift your mood instantly. Eminent poet Shahid Meer is always a hit among the poetry aficionados and here he struck chord with auidence when he recited in his unique style. For decades Shahpur Rasool has been among the most innovative poet. Sironj-born Khalid Mahmood, who is today a big name in Urdu poetry, recited a beautiful ghazal. Andjustice can't be done to it by producing just a couplet here. Another veteran poet who is a master in his own right, Bashar Nawaz, avoid popular gatherings but whenever he does attend a mushaira, his presence brings gravity to the programme. Shams Ramzi, about whom Shair recently published a special issue, is a critic and poet in equal measure. One couplet alone can give you an indiaction of his poetic calibre. However, romanticism isn't dead either though Urdu poetry touches contemporary issues. Some couplets evoke thunderous applause but are later forgotten. Others are jotted down and travel though emails and SMSs across the globe. You may not like the couplet which I find astonishing or a ghazal which you like may not appeal to me, as it depends on one's mood, mental state and certain other factors, however, poetry regales and relaxes at the same time. Just a couple of months back, legendary Makhmoor Saeedi rendered a ghazal which brought tears to the eyes of the audience. And today Makhmoor is no longer with us. 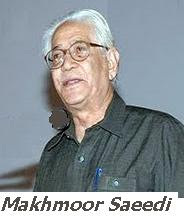 A few weeks back he also departed, leaving Delhi and Urdu poetry poorer. Empowering Eves or Elites: Will women's reservation work at ground level in India? A woman who was fed up of running from pillar to post, just to get the certificate that she was poor, attempted suicide in Ashok Nagar when the nation was busy celebrating the International Women's Day. For millions of poor Indian women [and men], these are the horrendous realities of life, which include corrupt officials not issuing BPL certificate and refusing to sanction widow pension [For those who may not be aware, BPL certification gets you basic commodities at a cheaper rate]. Even innumerable women working in Congress' scion Rahul Gandhi's pet NREGA scheme don't get their due wages. I can't forget the sight of the woman who was in the final months of her pregnancy with certain complications and wanted to avail the government scheme for delivery as Caesarian [operation] costs Rs 20,000 at a private hospital and this amount she couldn't dream of depositing in her lifetime. Will the reservation of 33% seats help this section of women? I sincerely hope and prey that this should happen though I have my own doubts. Across the political horizon, the daughters of dynasties are ready to take over. They are educated and belong to elite section and have never faced what ordinary middle-class, lower-class or poor women face. And they perhaps can never realise the real issues or understand these daily struggles. From Sharad Pawar's daughter Supriya Sule to Sunil Dutt's daughter Priya Dutt, from Agatha Sangama to ABA Ghani Khan Chaudhary's niece Mausam Noor, the list of the Elites* keeps growing. As more seats get allocated for women, on rotation basis, the 'MP-Patis [hubbies]' will be proxy MPs and the politicians' wives and other kin will take over. The first lady who I incidentally met Women's Day was a 24 year-old-girl, who lives 24 km away from her office and can't afford to travel in taxi as her salary is just Rs 7,500. She is quite a middle-class girl but barely gets to save money as there is no transport. If she comes by her two-wheeler, her salary will evaporate in a fortnight on fuel alone. In crowded three-wheelers that are full of molesters, it's a daily struggle. Yes, Delhi despite its notoriety has an infrastructure but rest of the Indian towns don't even have basic public transport and women have to squeeze themselves between men in three-wheelers, auto-rickshaws, vans and matador buses. My only worry is that politicians are just getting too sophisticated. They are not coming from grassroots. They do care for making grand statements and increasing their perks but are disconnected from the real problems of the large section of populace. Too much is made of education. But in Indian system, you need a politician who understands who things can be done, someone who can't be fooled by secretaries, middlemen and bureaucrats, one who understands the pulse of majority. He may not tweet but should know how bureaucrats fool citizens and siphon off funds. The *Elites who never travelled in buses, who have never been to municipal corporations, never stood in queues and have no idea about the difficulty in getting ration card or how long women wait at fair priced shops to get a few litres of kerosene, are now filling our parliaments and assemblies. The poor is just being shifted. We can't see him. If there is Commonwealth, the slums would be shifted. Across India, slums are dislocated as per whims, while skyscrapers built in gross violation of rules are allowed as their owners can afford to pay 'compounding' charges and penalties. On the International Women's Day, the Upper House passed the Women's reservation bill and clearly a majority of women appeared overjoyed, which is quite understandable. I sincerely hope that women, who are not disconnected, get elected and I wish that they at least see for once the scramble for getting kerosene--the most visible sight in every Indian city. Perhaps, they will have a realisation then. Channels don't show such things as they don't sell. We don't see them as clusters don't fall in our way and we have little time or because these women and children go and stand at such shops from as early as 5 pm. But that's the harsh truth. No one in Indian politics speaks [or cares] about it. 'Educated' Men and Women care about education and forget that MBAs, BEs, MBBS degrees are no longer for the poor or the lower-middle class at all. Government hospitals are meant for just the poor and the vocal middle-class doesn't go there, so they are in shambles across India. "The Congress' leadership has always been drawn from the upper castes. The same is true of BJP and strangely enough the Left....There is a distinct possibility that upper caste women can use their female identity to apeal to women and transcend caste identities, a little bit like rich Muslim leaders of the Muslim League appealing to poor Muslims exclusively on religious basis, bypassing class considerations. ", writes Jaithirth Rao in Indian Express. "Many have argued that the women's movement in US has done a disservice to blacks. By combining issues of racial discrimination with issues of gender discrimination, the beneficiaries have been white women and this has been detrimental to African-Americans". "We have discriminatory laws, for instance, women pay less income tax than men.....If Congress-BJP-Left combine to push through this measure, I believe that the opponents will have a strong case to get it struck down by Supreme court", the article further says. With due respects to Brinda Karat, we need women politicians who may not have directly reached Lok Sabha or Rajya Sabha, but such leaders who have at least won a municipal ward election so that they know what are the real problems of poor women & children [and men] in India. As far as Muslim representation is concerned, the fact is that the less the Muslim MPs the better it is. Slavish Congress politicians and glamdolls are useless. Further, its non-Muslims who raise Muslim issues better. In the last six decades barely 14 Muslim women have been elected in the dozen-odd Lok Sabha elections. The Congress is back to being a bully. The BJP simply played along and the poor arm-chair communists from JNU too happy to oblige. Mulayam Singh, Lalu Yadav and Ram Vilas Paswan would love it. Bihar polls are nearer and Ejaz Ali has arrived as the new 'fighter'. Whoever will be elected would surely keep getting their perks enhanced. In this case there is total unanimity in the Lok Sabha and Rajya Sabha [as also Vidhan Sabhas or Parishads]. Lets hope that as more women get elected, at least some of them would come from the grassroots [chances are very slim, as only multi-millionaires can fight elections]. And some of them who get elected will have concern for the society. Concern, genuine concern. Kerosene, Widow pension, Destitute allowance, Public transport, Health are just a few things. Otherwise we will keep twittering, facebooking and blogging as usual. On this note, welcome the women. Just when TV channels and media are expressing outrage over the unfortunate murder of a three-year-old Indian child in Australia, the apathy towards fixing responsibility of local administration in the tragic death of 63 persons including 26 children shows how dumb we are as a nation, especially our middle-class that has pretensions of knowing everything. The incident angers me because it reflects absolute failure of media, which not just failed in inform citizens as to who is the real culprit but instead goes ahead passes the buck on others including the hapless devotees. The news channels didn't for once said that who is to be blamed for lack of arrangements at the Ashram, rather they was busy giving clean-chit to officials, even praising them. In fact, I can't restrain myself further and must say that the reporting gave the impression that 'you poor devotees, you go to such places and you deserve to die'. And reports say that, 'Administration had not been informed by Ashram Authorities about the crowd'. This is the height of absurdity. It was not a political event. Temples and mosques don't inform the police about devotees and the likely strength of the devotees on Tuesdays, Thursdays or Saturdays [Friday in case of Mosques]. And if the administration is not aware of the event, the top officials must resign. Media keeps citizens ignorant about real fuctions and duties of the officials who are rarely held accoutable. In any case, the administration and police is always aware of all functions and crowded events in coming days. All journalists know that daily reports are prepared by local district-level intelligence, district administration, state intelligence and other government arms. On the basis of these reports, the SDMs and the DSPs, their subordinates tehsildars and beat policemen are assigned task to manage the crowded places. The system is well-entrenched and in place for at least over 150 years. From the smallest administrative unit--the koTvaar [not kotwal], patwari, tehsildar, revenue inspector, up to SDMs and collectors, it's a complete hierarchy. The state is not a joke. Arrange a small gathering at a public place or form a new society or group and you will come to know yourself. Local policemen will come and find out details. However, the state government and administration, having failed to ensure order, blame the Ashram and the case has been registered against the authorities. The media hasn't put things in perspective. The Mayawati government should have taken action against the officials rather than simply registering a case against the Ashram and putting the blame squarely on Kripalu Maharaj's hermitage. If I just quote from the Police Regulation, the duties of police clearly include arrangements at such public gatherings and fairs where they have to maintain a careful watch, ensure orderly arrangement and assist the Naib Tehsildar or other official deputed by the District Magistrate to oversee the arrangements. The poor can't be faulted as they went to the Ashram where they expected to get laddoos, lota [utensil ]and Rs 20. You can't blame them for their devotion also. It's clearly the fault of the state, the administration and the society. Celebritites lend support to campaigns in case of murder of one individual if he belongs to a particular class or section, but when dozens of poor die, no one speaks a word. 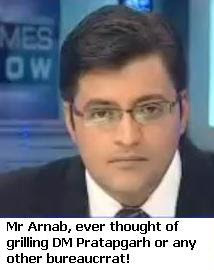 Shan't an achor like Arnab Goswami take to task the officials who are to be held responsible for the deaths in Pratapgarh? How can those who shout for hours over petty incidents, remain untouched by the sheer gravity of incident. No less than 26 children died! And if they don't care, then we surely have no moral right to call ourselves educated. Read past stories on how Indian bureaucrats wield maximum power but shun all responsibilities.